Goa Lawah is known as one of the most sacred temples in Bali. Local people call the cave temple as Pura Goa Lawah because it is used by thousands of bats. Local legend also said that the cave hides a river of healing waters and kept by a titanic snake with a crown. The cave temple is believed to have been built sometime around 1007 by an Indonesian saint. When it was built, there was no name given, the name was given by people due to the thousands of bats that cling to the walls and ceiling of the cave. In Balinese, “Goa” means “cave” while “Lawah” means “bat.” Some people, including researchers believed that the temple cave may extend all the way to a nearby town through the mountain. Legend said that the tunnel is the home to a mythical snake known as Vasuki, which is often drawn as a gigantic snake that wears a crown. Another legend said that a river contains miraculous healing waters rushes inside the cave. Based on the chronicle of Bendesa Mas, it mentions that the temple cave was built by a Hindu piest from Java namely Mpu Kuturan. The priest then lived in Bali in Silayukti in Padang Bai. It is said that the priest also built some temples similar to the Goa Lawah Temple. In the yard of the temple, there are several Meru and sthana. Based on legend, Mpu Kuturan comes to the island of Bali in the 10th century, leaving java. Mpu Kuturan was the children’s youngest brother of King Airlangga who ruled in East Java from 1019 to 1042. When arrived, the priest found many sects. Finding such fact, mpu Kuturan then developed the concept of Tri Murti in order to collect all of the sects. The Papyrus of Dwijendra Tattwa wrote that after Danghyang Nirartha stay some nights in the temple cave, he build a Kahyangan Temple. It means, Danghyang Nirartha extends the temple building existing there at the temple cave. Lawah cave is very interesting to visit because of its strategic location. It is located off the coast with amazing views of the sea as well as the island of Nusa Penida in the distance. If they are lucky, tourists can witness traditional ceremonies on the beach. However, one of the most popular attractions in Lawah cave is surely the tail bats hanging inside the cave. 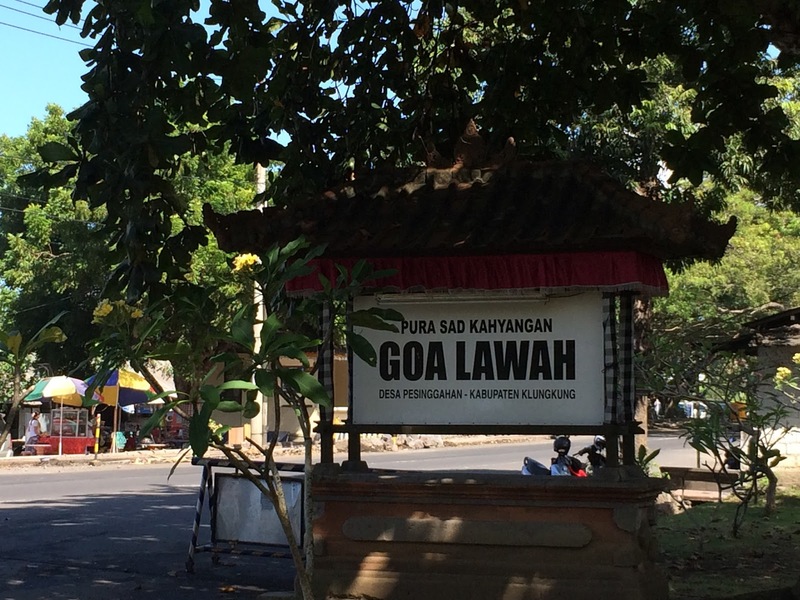 Administratively, Goa Lawah temple is in Klungkung or about 1 hour drive from the city Denpasar. One thing has to be remembered by tourists is that the cave Temple is a sacred. It means, they have to follow every instruction and do not do prohibited thing. They also have to remember that this temple is a cave inhabited by thousands of bats, so it may unconvenient for some people. In the yard, also stood firm several Meru and other sthana. It is said that MPU Kuturan come to Bali during the tenth century the government-led Children’s youngest brother of King Airlangga. Airlangga own rule in East Java (1019-1042).